The start of school is just around the corner. All parents should be sure to review the Preparing for School page that can be found HERE. If you have any questions or need any assistance, please contact the High School Office at 402-393-1256. A reminder that the first day of school for all students is Tuesday, August 14 and that we will be celebrating the Mass of the Assumption on Wednesday, August 15. This will not be a formal dress day. A reminder that freshmen will be picked up by their senior Big Brothers on Monday morning, August 13 and taken to Prep to participate in the registration period for freshmen and seniors from 9:15 a.m. to 10:45 a.m. They will then go through an abbreviated version of the school day and have the chance to meet all of their teachers. During the course of that abbreviated school day we will provide them lunch. The day will end at 2:45 p.m.
Sophomores and juniors should plan to be at Prep to register that morning between 8 a.m. and 9:15 a.m. Serve in the Prep Moms Organization This Sunday And Throughout 2018-2019! Welcome to a new school year! Before you know it our sons will be back in the classroom. The new school year brings many opportunities for us, as parents and guardians, to support the students, faculty and staff of Creighton Prep through Prep Moms. While most of our members are mothers of Prep students, we warmly welcome the participation of fathers, grandparents and friends as well! This is a dues-free organization; every Prep parent or guardian is officially a member! Our first school event is the New Families Mass, Dinner and Orientation this Sunday, August 12 when we will welcome all our new families to the Prep community. Prep Moms needs your help with providing desserts and volunteers for the event. Please sign up HERE to help us make this event successful! Helping out with Prep Moms committees for this event and many others throughout the 2018-2019 school year is a great way to get involved and meet other members of the Prep family, and, with school starting shortly, I would like to ask you to identify the committees in which you have an interest in serving by clicking HERE. The Prep Moms committees will also be involved in other August events such as the Welcome Dance on Friday, August 17 and Curriculum Night on Tuesday, August 21, so please try to visit the website and sign up for committees as soon as possible. When the committees in which you expressed interest need volunteers for particular events, you will receive an email directing you to a SignUpGenius page where you can volunteer for specific tasks. Many of these meetings will have a "featured Prep speaker" such as Principal Jim Bopp and/or President Fr. Tom Neitzke, SJ, and they are a great way to learn what is going on at Prep! I look forward to your participation in Prep Moms this year! And please feel free to contact me if you have any questions. The Dean’s Office is welcoming donations of dress code items to have on hand for student use. Items include shorts, polo shirts, dress pants, dress shoes, button-up dress shirts, and belts—all of any size and in good condition. Dress shoes of any size are especially needed. Simply have the items dropped off at the Dean’s Office during office hours. Thank you for your consideration! This is a reminder to the parents of incoming freshmen and transfer students who have registered for the New Families Mass, Dinner and Orientation that the event will be held here at Prep this Sunday, August 12, beginning with a Mass in the Heider Center at 5 p.m. We will then enjoy dinner and dessert provided by FLIK Independent School Dining and the Prep Moms in the Sullivan Center. After dinner, parents will remain in the Sullivan Center for a special parent orientation organized by Prep's administration while freshman and transfer students engage in recreational activities organized by the Big Brothers. The evening should conclude around 8 p.m. Prior to that night, you are encouraged to read through the Life at Prep FAQs found HERE, as well as the Student-Parent Handbook found HERE. Thank you for taking the time to RSVP. We look forward to seeing you on Sunday, August 12 at 5 p.m. in the Heider Center. If you have any questions, please call the High School Office at 402-393-1256. Fathers of incoming or current student athletes in the Creighton Prep football program as well as Prep alumni are invited to the Creighton Prep Football Dads Night on Wednesday, August 15 at The Old Mattress Factory at 501 North 13th Street in downtown Omaha. A social hour begins at 6 p.m. followed by an overview of the Prep football program at 7 p.m. by Varsity Football Head Coach Tim Johnk. A menu and cash bar will be available as well. On Friday, August 17, sophomores and juniors will be meeting with Campus Ministry during the community period to learn more about Prep's retreat offerings and to receive instructions on how to sign up for their annual retreat. All sophomores are required to participate in the Faces of Christ Retreat and have the option of participating in the Sophomore Overnight Retreat. Juniors have the option of participating in the Junior Encounter Retreat OR the Ignatian Service Retreat. During their August 17 meeting, sophomores and juniors will be sent an e-mail with a link to sign up for their annual retreat and will receive information about each of these retreats and the expectations for participants. All freshmen are automatically signed up for our annual Freshman Retreat which takes place from Thursday, January 31 to Saturday, February 2, 2019. Seniors will have the option to sign up for their senior retreat near the start of the second semester. 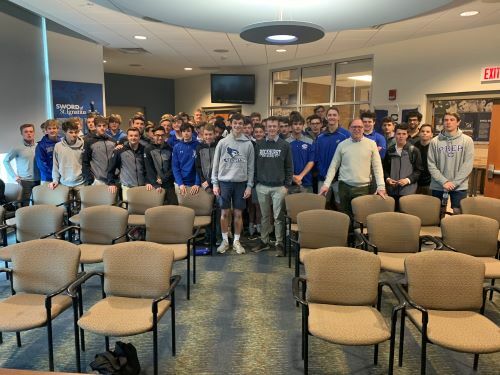 If parents have any questions about Prep's retreat program, they may contact Mr. Dave Lawler in the Campus Ministry Office at dlawler@creightonprep.org. Get a preview of the varsity and junior varsity Junior Jay football teams as they play in the annual Blue-White Game on Friday, August 17 at 6 p.m. in Carmen & Don Leahy Stadium, located at the north end of the west parking lot. See you there! The Creighton Prep Student Council invites all current Prep students as well as students from Duchesne, Marian and Mercy to attend the Welcome Dance on Friday, August 17 in the Henry L. Sullivan, S.J. Campus Center. The price of admission is $5/student. Prep students must have their demerit card, and students from Duchesne, Marian and Mercy must have a student I.D. to enter. New students from the three all-girls’ schools who have not yet received an I.D. are also welcome. We will have lists of students provided by their respective schools. Doors will open immediately after the Blue-White Game ends, and the dance will end at 10:30 p.m. Prep students should arrange to be picked up in the west lot. In addition, they can bring only one female guest from other schools besides those listed above and must have had a formal Guest Pass obtained, completed and returned to the Dean's Office by noon on Friday, August 17. 7:00 p.m. - 7:15 p.m.
7: 20 p.m. - 7:30 p.m.
7:35 p.m. - 7:45 p.m.
8:05 p.m. - 8:15 p.m.
8:20 p.m. - 8:30 p.m.
8:35 p.m. - 8:45 p.m.
Creighton Prep cordially invites you to join the students, faculty and staff, and Jesuit community in the Heider Center at 9:45 a.m. on Tuesday, August 28 for the Mass of the Holy Spirit. At this special Mass that annually marks the beginning of a new academic year at the school, we will ask for the blessings of the Holy Spirit on our community. The Most Reverend George J. Lucas, Archbishop of Omaha, will preside and be assisted by, among others, Fr. Tom Neitzke, SJ, the president of Creighton Prep, and Fr. Brian Paulson, SJ, the provincial of the USA Midwest Province. Together, they will distribute missioning crosses to the student leaders of Prep clubs and activities. Since this is traditionally the school's largest Mass event of the year, you are encouraged to arrive early, park in the east lot and enter the Heider Center through the main entrance at the northwest corner of the lot. Thank you and we look forward to seeing you on Tuesday, August 28! Please note that the next Prep Moms meeting will be held on Tuesday, September 11 at 7 p.m. in the Carta Hall of Fame Room just inside the Heider Center entrance. All Prep parents are welcome to attend, Principal Jim Bopp will be there to provide an update on the school. These meetings are a great way to learn about Prep and to get involved with your time and talent at the school. See you there! 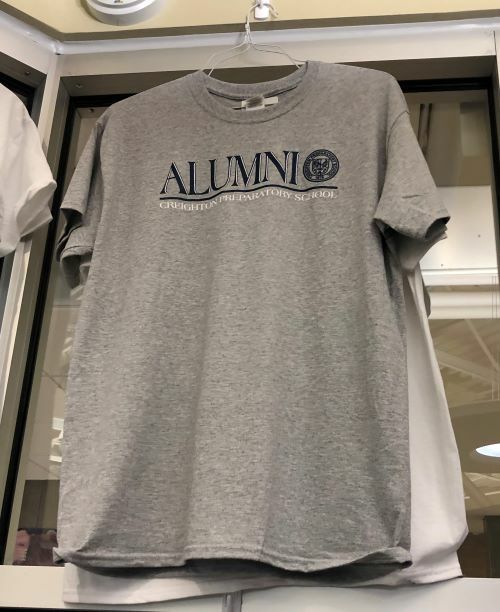 Plan to join your Prep friends on Saturday, September 22 in the west parking lot and in the Sullivan Center at Prep from 4:30 p.m. to 10 p.m. for Preptoberfest, a celebration of all things Prep including reunion weekend, 140 years of Jesuit education and the formal kickoff to the 2019 AMDG Annual Fund campaign. The evening will include live music by Finest Hour, beer and wine, and food trucks, and attendees must be 21 years of age or older. Please register for Preptoberfest today at www.creightonprep.org/preptoberfest. Thank you! The format will be two-player best ball. 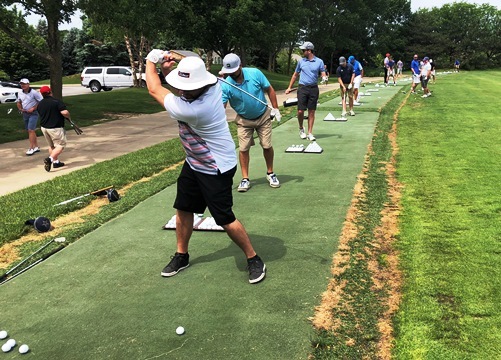 Check-in / driving range begins at 10:30 a.m. followed by a 12:30 p.m. shotgun start. The individual golfer fee is $400. Click HERE to register. 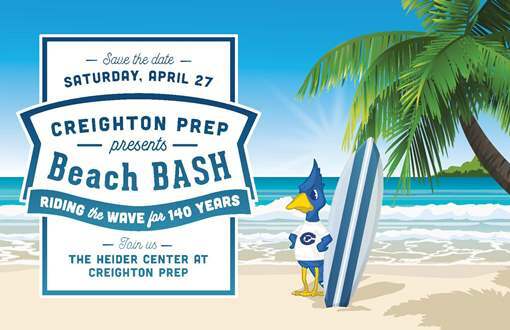 If you would like to help sponsor the event, please contact Director of Alumni Relations Max Huerter ’09 at 402-548-3851 or mhuerter@creightonprep.orgrg. Thank you! Save the date of Tuesday, October 2 when Creighton Prep welcomes former Notre Dame national championship football coach and College Football Hall of Fame member Lou Holtz as the featured speaker for the 27th Annual Creighton Prep Sports Night. Prep mothers, please save the date of Sunday, October 7 for Creighton Prep's annual Mother-Son Mass and Breakfast. This special occasion is for mothers and sons of the Prep community, Catholic and non-Catholic alike. The Mass will be concelebrated by members of Creighton Prep's Jesuit community. Registration information will be communicated in a future Parent Pulse. Canvas is Creighton Prep’s learning management system. Through Canvas, you can view your student’s academic calendars with homework, tests, and long-range projects, find course syllabi, etc. To access your Canvas account, click HERE. Look for the “Parent of a Canvas User?” link on that page. You will need your student’s username and password to register. PowerSchool tracks your student’s course grades, assignment-specific grades and comments, attendance history and discipline history including demerit and Jug totals and obligations still owed. In PowerSchool, you have the option to sign up to receive notifications regarding your student’s grades. For a tutorial on how to use PowerSchool and set up notifications, click HERE. To access your PowerSchool account, click HERE. Welcome, New Teachers and Staff Members! On Wednesday August 8, Prep welcomed new teachers and staff members, including Sterling Brown (Dean of Students), Christianne Clark (Director of College Counseling), Lisa Cook (Social Studies), Matt Delaney (Social Studies), John Fraser (World Languages), Trent Goldsmith (Social Studies), Will Hausman (Alumni Volunteer Corps), Kevin Kaminski (Student Support Services), Rich Mansfield (ToMorrow Labs Manager), Jeni Martinez (Director of Loyola Scholars), Amy Masek (Theology), Dr. Renée McGill (English), Olivia Poggenpohl (Director of Communications), Dr. Martin Townley (Design Technology), Dakota Wagner (Alumni Volunteer Corps), Carolina Westling (World Languages, part-time) and Bethany Widman (English). Congratulations to Head Coach Pat Mooney, his staff and the players on the Five Points Bank American Legion baseball team on their great 42-17 season that ended near the completion of state tournament divisional play in Columbus on Wednesday, August 1. The team started the tournament on Saturday, July 28 against Grand Island Home Federal, winning 4-2 and helped by a strong pitching performance from Noah Peyton as well as stout defensive play. On Sunday, July 29, the squad was edged 4-3 by Lincoln SW Pinnacle Bank despite a two-run home run from Owen Richter and another fine pitching performance, this time from Spencer Jonas. They rebounded the following day in an 8-3 win over Kearney Runza, led by pitcher Max Mandel and timely hitting from the offense, and found success again on Tuesday, July 31 in a 7-2 victory over Burke Black C&H Construction that was highlighted by a two-out rally in the 4th inning and excellent command by pitcher Zach Firmature. From there, the team advanced to a Wednesday, August 1 matchup with the Millard South '52's Patriots, falling 3-2 to end their state tournament run. The floor renovation project began with sanding the surface using different grits of sandpaper in order to get it very smooth. After that, stain was applied to darken both three point areas around the free-throw lanes. Graphics for Billy as well as Creighton Prep, AMDG and Jr. Jays were then added along with a coat of PMS 280 Blue (Prep blue) to the baselines and sidelines as well as striping on the two outer courts. After that, covers on the graphics were removed and multiple coats of sealer were applied. Gear Up For Fall At The Jay Mart! All football parents are encouraged to regularly visit the Creighton Prep football portal for key information and announcements on events, committees and apparel orders as well as volunteer links. 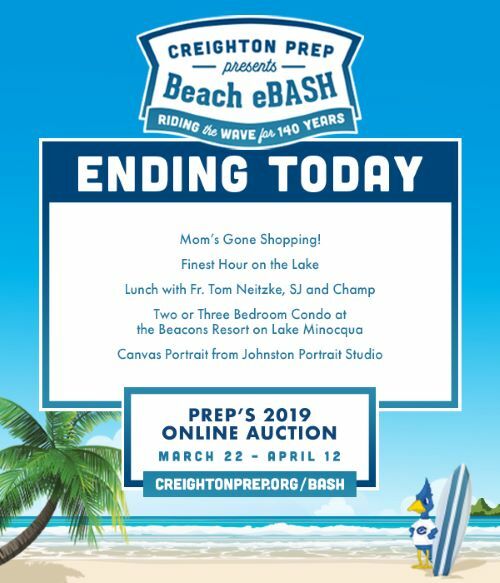 Your participation and support of Creighton Prep football will greatly benefit our athletes and help carry on the history and tradition of Creighton Prep athletics! 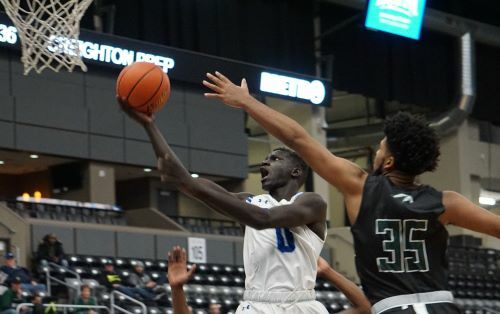 To keep up to date on all the happenings at Creighton Prep, bookmark our home page, like us on Facebook and follow us on Twitter!